Elephantech Inc. (HQ: Chūō Ward, Tokyo, CEO Shinya Shimizu, hereinafter referred to as “Elephantech”) are developers of P-Flex™, a complete mold-less and low cost flexible PCB made possible by printed electronics technology. Elephantech will start sales of P-Flex™ PI which uses polyimides for its base film instead of the PET used in the original P-Flex™. 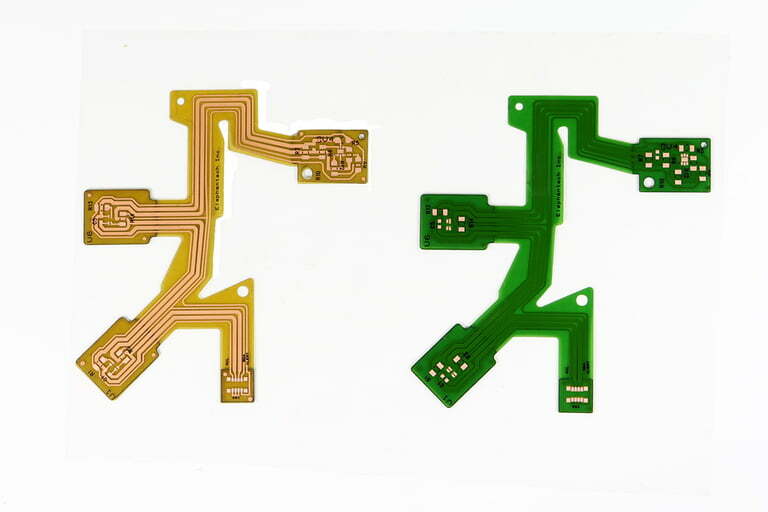 Elephantech has developed “P-Flex™”, a complete mold-less and low cost flexible PCB, by using the technology of printed electronics. P-Flex ™ not only reduces mass production cost compared to conventional flexible PCB, but also has zero mold cost, so, as a manufacturing method conforming to the world where many kinds of products are reduced and mass customization progresses, we have gained popularity, especially from customers of mass production of small and medium lots of tens of thousands of units per year, and have expanded sales. However, up till now, there remained a problem with P-Flex™ not using polyimides for its base film, as is standard for flexible PCB, but PET instead which has inferior heat resistance. This was because we were unable to attach the base film and printing technology formed metal wiring closely enough with anything other than PET. As of today, we have succeeded in developing polyimides and are ready for mass production through use of a special metal ink, special processing of the film surface, and other process optimizations - we’re ready to open shop. In the future, we’ll be looking at providing a one-stop service from the manufacturing of the P-Flex™ PI to the mounting of the components.